The Doogee P1 is an entire big screen portable entertainment system in a compact 62mm cubed package. If that’s not amazing, I don’t know what is any more. It costs less than $200, available now from GearBest.com. 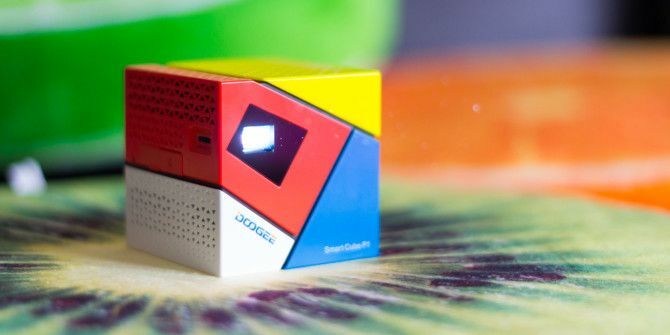 This is the cutest little projector I’ve ever seen – a playful looking device about the size of a Rubik’s cube and just as colorful. Inside the less than 300 grams package is a 70 lumen LED projector with a native resolution of 854 x 480px. That’s coupled with an Amlogic quad-core CPU, 1GB RAM, 8GB of storage, and a small speaker. It runs a full version of Android 4.4, which is obviously outdated but still fully functional, and remains the choice of many embedded Android systems. Connectivity is sparse however: a single USB port for connecting accessories, and a micro-USB port for charging the 4800mAh battery, but no HDMI for generic video input. Wireless connectivity comes from Bluetooth and 2.4Ghz Wi-Fi (not AC). The USB OTG port can be used to add storage, or easily connect a mouse and keyboard, and you can even use it to charge your phone. The projection quality is nothing stunning – 70 lumens and slightly higher than SD resolution won’t win any awards. A small dial on the side manually adjusts focus. The throw ratio is 0.7, so placing the Doogee P1 at 100 inches from the wall will leave you with a 70 inch diagonal projected display, albeit not a very bright one. Clearly, this isn’t designed for use in bright daylight, though you could get away with a small projection. On a cloudy British day, up to about 30 inches diagonal was acceptable; with the curtains drawn, I was limited by the throw distance rather than brightness. Make sure to watch the video for a demonstration of the largest output I could get, which is still incredible considering the size of the thing. There is no brightness adjustment, because I doubt you’d ever be in a situation where it’s too bright. The speaker is unexpectedly loud and more than adequate for media playback, though the quality is as expected from something so small. There is no external connection for audio, so if you wish to connect something else it’ll need to be done over Bluetooth. Unlike other Pico projectors we’ve looked at that offer streaming capabilities, it’s worth remembering that the Doogee is running a full Android system, so you can install Kodi or Plex just as you would on your mobile device, and play back media directly from the on-board or USB storage, without the need for another device to act as the streaming client. This makes the Doogee P1 entirely self-contained as a media system, and that’s a pretty amazing feature considering the size. It’s not a particularly powerful device, but more than enough to run streaming video apps and some basic gaming. Antutu scores it at around 16,000. Unfortunately, the device is as unreliable as it is cute, at least when you first set it up. Initially it was unable to connect to anything other than a completely unsecured Wi-Fi network. I made a guest network to test with, and managed to update the firmware using the Wireless Update option, but I couldn’t get Google Play to open at all. Finally, after multiple restarts and then a complete factory level reset, Google Play opened and it connected to my legacy secured 802.11G network (not AC). Even then, the connection quality varied dramatically, and I was unable to get a good enough connection for streaming much of anything, in rooms where other devices have no problems – so the antenna is clearly substandard. Installing any app usually resulted in errors, but usually worked after a few retries – this might have been due to the flaky Wi-Fi connection. The experience was overall rather frustrating. HappyCast is the included app used for AirPlay functionality, and it mostly works. I was able to mirror my phone, but not my Mac desktop. I did have some initial problems with YouTube, but the update sorted that out. MiraCast What Is Miracast? How to Use Miracast for Wireless Media Streaming What Is Miracast? How to Use Miracast for Wireless Media Streaming HDMI may be the standard for connecting media devices, but it has a lot of downsides. Here's how to use Miracast instead. Read More functionality is also there, but Windows 10 refused to connect – you’ll probably have more luck if you’re using an Android client, though the technology is still in it’s infancy with many different implementations, so it’s hit and miss. Note: I’ve since been contact by Doogee who informed that these were pre-release media units, and that the final models shipping to customers will not have these issues (which I assume means they’ve updated the firmware already). They also said that apps in the Google Play store which are designed for Google TV should work more smoothly. Stated screen-on time is 3 hours from the 4800mAh battery, but this is an absolute maximum and in practice I found around 90 minutes was more likely when streaming a video over Wi-Fi at full voume. Playing back local content and disabling Wi-Fi would give you longer life. You can in fact also use the OTG USB port to charge your phone, should you be in an absolutely desperate situation. Upon powering on the system, a QR code is displayed and an ad-hoc Wi-Fi network created. Scan the QR code and you’ll be taken to a site where you can download the remote control application for iOS or Android. Once you’ve opened the app and connected to the ad-hoc network, you must scan the code again to authenticate, at which point the remote connects to the device and gives you a directional control pad, some buttons, and volume controls. At that point, you can go ahead and stream local content from your mobile device to the Doogee P1, or use the remote to run applications natively on the device. This will be the most common use case when travelling or camping – anything where you don’t have a reliable Wi-Fi connection. You can also use the Wi-Fi button to select and enter the password for the network you’d like it to connect to; but having done that, you’ll need to scan the QR code yet again to reconnect once it’s switched networks. If that sounds absurdly awkward for use around the home, that’s because it is. However, I’ve yet to find a Pico projector that handles it any better; the Doogee P1 is no different in that respect. Where is does differ is that with a full size USB port, you can plug in a mouse or other pointing device, which is how I ended up doing the majority of my testing. Unfortunately, it’s been designed with use of the app in mind, so every time you turn the device on, the ad-hoc network is created, instead of connecting to the last known network. It would be nice to have the option to change the default action, perhaps even open a specific application on system start-up. In addition, when trying to connect to network, the ad-hoc network notification keeps being generated every ten seconds – which breaks the process of connecting to your own network if you haven’t managed to type the password in quick enough. Get around this by copy-pasting the password, or just use the app to save your credentials. Should You Buy The Doogee P1? The design implies playfulness, yet the experience delivers frustration for the most part. It’s hard to recommend this as is: if the price were to drop by around $50, I might be more forgiving; or if a future update fixes some of these frustrations. The fact that all this functionality can be jammed inside a little cube though is amazing; I’m just struggling to find a genuine use case for it. The same is true for most Pico projectors, however. The Doogee P1 is certainly one of the better designed small projectors I’ve used – but it could still be better. Explore more about: Apple Airplay, MakeUseOf Giveaway, Media Player, Miracast, Projector. so very very cool, this mum needs this awesome lil baby!! good luck to all! I am also hoping to win!! Would like to get a projector, especially a really portable one. But not quite ready to buy one until the prices come down a bit. Could care less about how it looks, but functionality and ease of use? Those are musts. Hoping to win, otherwise I'll wait for the firmware update as suggested in the review. Going by specifications, it's not bad at all; though we can look forward to improvements. Thanks for Valuable Info... Excellent.!!!!!!!!!!!!!!!! I would be very happy to win the DOOGEE P1 Swmartcube to experiment with. Thank you for the chance to enter. I wouldn't pay that much for one, but I'd happily accept one for free.